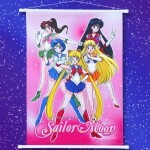 More Sailor Moon 20th Anniversary Merchandise Announced! 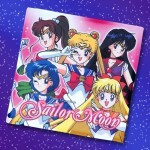 Fumio Osano (aka Osabu) shared a lot of new merchandise earlier today on Sailor Moon Channel! He also tweeted earlier that he will do his best to make sure the manufacturer has enough product supply. First, he announced a special 20th anniversary wallscroll and microfiber mini-towel. The mini-towel retails for about $6.30 USD, and is fast absorbing with a full color print. The wallscroll is also in full color, and retails for about $33 USD. 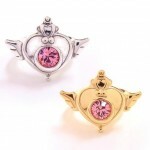 The next items that were announced were a gold and silver ring, designed after Sailor Moon’s Crisis Moon Heart Compact in Sailor Moon SuperS. Both rings are made of sterling silver (or silver 925) and the gold ring is coated with 18-carat gold. Both rings feature a pink Swarovski crystal in the middle. And these are quite pricey, retailing at around $166 USD. The rings, the poster, and the towel are all being sold from Premium Bandai. Lastly, a few weeks ago the Tamashii nations S.H. Figuarts Sailor Moon line announced that Sailor Mercury was going to be next! And today, it was confirmed that the figure would be released in Japan in October. 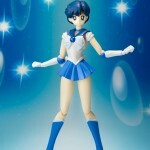 The figure will have some hand and face parts, and come with Sailor Mercury’s computer and visor. The faces being included are supposed to resemble her gentle expressions. We are working to find you some details about pre-ordering and hope to share that with you as soon as we are able to. For sure though, we can guess the price of Sailor Mercury won’t be too different than Sailor Moon’s (around $43 USD). All of us at Moon Chase hope that ordering from Premium Bandai will become a lot easier in the face of the struggles that happened this week! 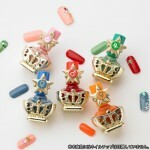 Sailor Moon Nail Polish Announced! Hot on the heels of the compact announced a week ago, another set of Sailor Moon cosmetics was announced and tweeted by Fumio Osano (Osabu) today. 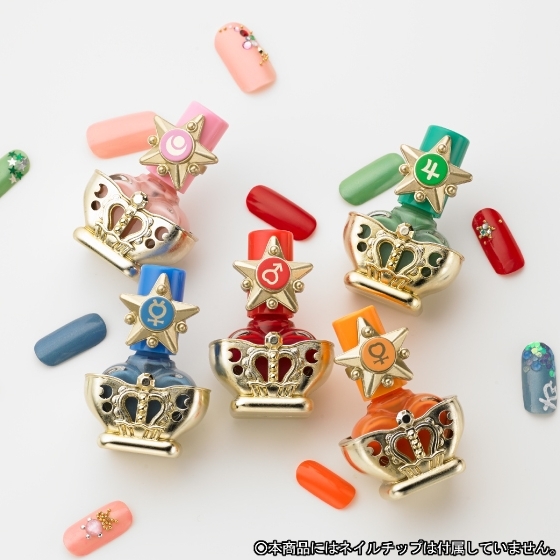 The Sailor Moon R Miracle Romance Nail Collection features nail polish in pink, blue, red, green, and orange in artfully designed bottles that are representative of the Senshi’s transformation wands. In the post on Sailor Moon Channel, Osabu writes that there was a bit of a challenge in finding the right colors to appeal to adult tastes. The photo on Sailor Moon Channel as well as on Premium Bandai show some nail art accessories that they used to make some fake nails look nice, but it does not appear that those are going to be included (sorry, you will probably need to find a skilled manicure artist to replicate those). And going by the dimensions posted for the bottles themselves on the site, they appear to be quite a bit smaller than what you would usually expect to see for a nail polish bottle. The collection will go on sale tomorrow, and will cost 5,250 Japanese Yen, or about $53.50 USD. We will refer you to our earlier post about where to purchase the compact. While we understand that JList (and maybe some other sites) will be carrying the product, please understand that there is now a strict limit on how many of each item can be ordered. Last week it was around 20, this week it is only 2. On each page it says that Premium Bandai would like to be able to sell to more customers, so they have imposed this limit. As far as we know, Premium Bandai has not licensed anyone to distribute the product and we do not know how many of these sites that are promising to sell the product are going to be able to meet the demand. We strongly encourage our fans to look at the shopping services again, which (we will say this again) both have special sections on their site where you can send them a site url and they will order whatever is on there for you. Do not use the search functions there as that will most likely only search Yahoo Auctions. Crystal Brooch Compact Temporarily Sold Out! Wow! We are all surprised that Premium Bandai and Creer Beaute have sold out of this product in under 24 hours, and over a week before the product has been shown to the public! But fear not! There will be a second run – please watch Premium Bandai‘s page for more information. On another note, please refer to our last post for two Japan shopping services that have been confirmed for their ability to order this product. EDIT: Moonies, Fumio Osano (aka Osabu) tweeted this morning that the compact will be up for pre-order again on June the 12th at 10AM Japan Standard Time. This compact will also be shipping until sometime in November, according to the link. World Time Server has a handy converter (Time here, Time there) that lets you figure out what time it is in your local time zone. We recommend going to our last post for links to Japanese shopping services that have been confirmed as able to order this product, and placing your orders ahead of the day. Moon Prism Power REAL Make-Up! Hot off the presses Moonies, Fumio Osabu has just announced that a Sailor Moon Makeup Compact will be hitting the stores in Japan. After many requests from fans for transformation items, “Crystal Brooch” is the first authentic Sailor Moon-themed adult makeup product ever! The compact is aimed for girls who loved the compact toy who have now grown up to be women who wear beautiful makeup. 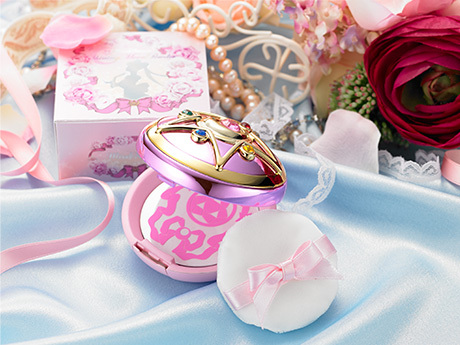 The compact comes with “Sailor Moon R Moon Miracle Romance Shining Powder” pressed powder, and a mirror. Special attention was paid to the detail of this product as it actually looks like Sailor Moon’s compact. The compact will be unveiled to the public at the Tokyo Toy Show at Tokyo Big Sight on the 16th. More ordering information is at Premium Bandai. This compact will be produced by Bandai’s premiere cosmetics line, Creer Beaute. The price is listed at 3980 Japanese Yen, or around $40 USD. What do you think Moonies? Would you like to see something like this at Sephora? EDIT: This product will not be available for shipment until October, but pre-orders are available as supplies permit. EDIT: Some more details have been learned about this product. 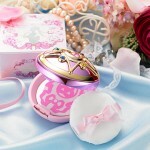 The powder has a gentle “Princess Floral Fragrance” that is smelled when you open up the compact, and the powder has been specially formulated to absorb sebum to avoid that oily look on the face (I am curious if Naoko Takeuchi’s background in chemistry and pharmaceuticals contributed at all?). But this will not dry out your face as the powder has a moisturizing component to it. And finally, the powder will have some pink glitter elements to it to give the skin a glossy tone. New Sera Myu Musical Announced! Hi Moonies! Yours truly had heard rumblings of a new musical a few days ago but waited for someone official to say something publicly. I can now confirm that there will be a new Sera Myu musical premiering in Japan this September for a very limited run of 9 days – from the 14th to the 23rd at the AiiA Theater Tokyo in Shibuya. Obviously, the production team is very busy in trying to work out the kinks involved in the new anime series, so while Naoko Takeuchi is likely to be overseeing the production, an entirely different team is going to be producing and directing the musical. Among those is Takuya Hiramitsu who has written the screenplay and will be directing. Takuya has previously directed and wrote screenplays for 10 Sera Myu musicals from 1995-1998 – so he is well seasoned towards Sailor Moon (Super Senshi e no Michi, Yume Senshi, Sailor Stars, Eien Densetsu, Shin Densetsu Kourin and all their kaitebans). Organization will be handled by DWANGO (probably manage the web presence of the musical), NELKE Planning (likely casting and production), and Kodansha. As of this writing, Toei Animation is not involved as they had been in previous musicals. Sera Myu was very successful in its run of 27 different productions and 800 performances from 1993-2005. There will also be an entirely new cast made up of entirely women, akin to Japan’s Takarazuka revue. This was a shock to me when I had heard about it, (and I did not believe this) but nonetheless, it will be interesting to see how this takes Sailor Moon in a brand new direction. Naoko Takeuchi was also there for and participated in the casting process! The biggest confirmed cast member at this point is none other than former Takarazuka star Yuuga Yamato, who will be playing Tuxedo Kamen (or Tuxedo Mask) who has had plenty of amazing roles under her belt playing male characters. Playing Sailor Moon is Satomi Ohkubo, whose biggest role so far has been playing Lisa Izawa this year in the Japanese supernatural detective drama Galileo. Playing Sailor Mercury is newcomer Miyabi Matsuura who was chosen as Junon’s Grand Prix winner for their girl’s talent contest last year, and who had her first stage role in Girl Story earlier this year. Playing Sailor Mars is Kanon Nanaki, who is an idol singer. Playing Sailor Jupiter is Yu Takahashi, who played Yuri Aso in Kamen Rider Kiva. And finally, Sailor Venus will be played by Shiori Sakata, who graduated from the idol group Idol College in 2012, and has been in NHK’s high school drama Kingyo Club, and had a role in the musical Sing! last year. For fans who want to get tickets, there will be details in tomorrow’s edition of Nakayoshi. A schedule of performances is posted at Sailor Moon Channel, and tickets will cost 6800 Japanese Yen (or around 68 US Dollars). But those who pick up Nakayoshi will be able to start reserving tickets from tomorrow! This new team definitely has many high expectations for this production not only from fans, but from everyone involved at the top level of Sailor Moon, (considering the excessive secrecy behind the new anime series, this could be the only new production anyone sees for a long time)??? We wish them all the best of luck, and we will keep you posted of any new details as soon as they happen.